2.Electrode material for batteries, such as lithium ion battery, fuel cell, nickel-zinc battery, etc. 5.Various initial-efficiency, intermediate-effeciency and sub-micron filtration material . is the original name of LinYi Gelon New Battery Materials Co., Ltd. 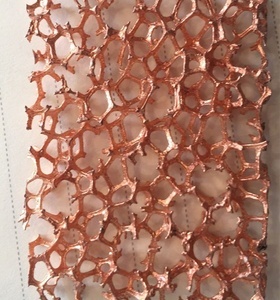 Product: Porous Metal Foams PPI: 5-120 Thciness: 1.5-30mm Density: 0.15-0.5g/cm3 Size: 500*500mm Usage: catalytic converter & many other fields Application Copper foam is a kind of engineering material with good performance and multi-functions, which is light, anti-corrosion, heat-resistant, great specific surface area, high chemical activity and also has various functions of filter, carrier, distributing gases, electromagnetic shield, absorbing shock and absorbing sound, etc. 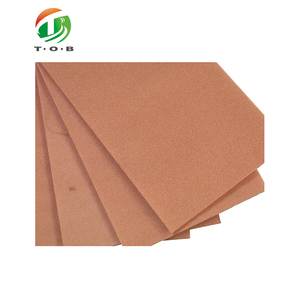 It is widely used in aviation industry, vehicles, construction industry, chemical industry, metallurgical industry, medical and military industry, etc. Regarding the transprtation, if your quantity couldn't reach 1*20ft container, we suggest you by air, by Express, not by sea. 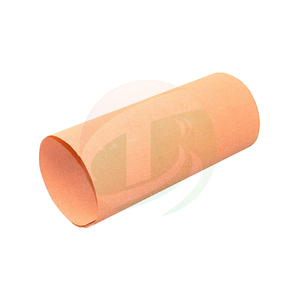 Especially copper foam is the base material used as an electrode of the battery, with some obvious advantages. 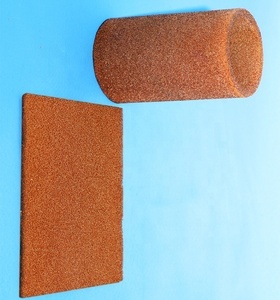 Copper foam in round shape Copper foam can be made in different shape as per customers' requests. We are also in the position to produce and process the customized carbon and graphite products. 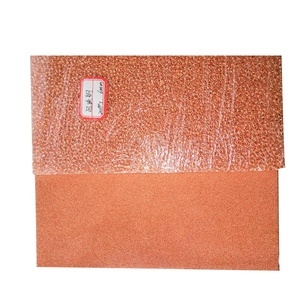 Xiamen Lio Tech Co., Ltd.
Copper Metal foam has been widely used as electrodes in NiMH and NiCd batteries. In addition to the wide range of commercially available foam products, new grades of Nickel based foams with improved corrosion resistance, mechanical strength, electrical conductivity and high temperature performance are being developed. 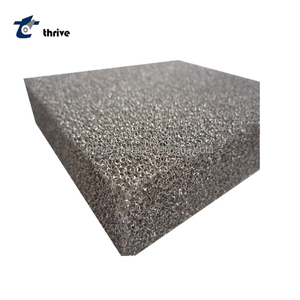 High Quality Open Cell Porous Metal Foam . 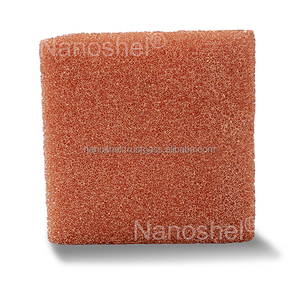 Detailed Images High Quality Open Cell Porous Metal Foam . 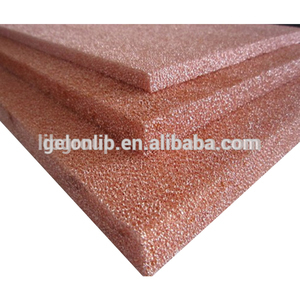 Property High Quality Open Cell Porous Metal Foam . High purity, dendritic shape powder,high electrical and thermal conductivity. Then we can quote price and detailed information according to your specific technical data and requirements. 5. Q: How does your factory do regarding quality control9 A: Quality is priority. 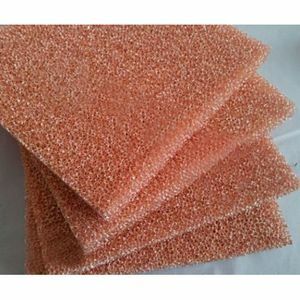 Alibaba.com offers 32,678 copper foam products. About 1% of these are other metals & metal products, 1% are filter meshes, and 1% are other copper. 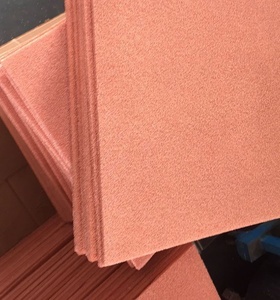 A wide variety of copper foam options are available to you, such as free samples, paid samples. There are 32,663 copper foam suppliers, mainly located in Asia. The top supplying countries are China (Mainland), India, and Taiwan, which supply 99%, 1%, and 1% of copper foam respectively. 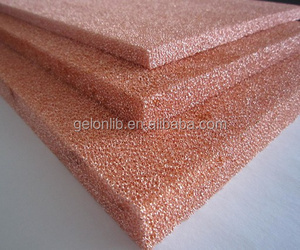 Copper foam products are most popular in North America, Eastern Europe, and Domestic Market. You can ensure product safety by selecting from certified suppliers, including 10,239 with ISO9001, 3,258 with Other, and 1,385 with ISO14001 certification.